Government Industrial Training Institute Tapi Has Issued Notification for the recruitment of Pravasi Instructor Posts In Government ITI In Various ITI Of Metoda(Lodhika). 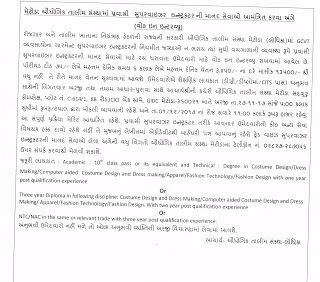 More Details Related This Recruitment Like Age Limit, Selection Process, Qualifications and Others Are as given below. Educational Qualification: Candidates Are Advised to read Official Notification for Educational Qualification details. Address to Sent Applications: Principal, Industrial Training Institute (ITI) - Metoda, Sadguru Complex, Plot no. C-614/1, 8B Road, Opp. ICICI Bank, GIDC Metoda, Dist- Rajkot 360021.